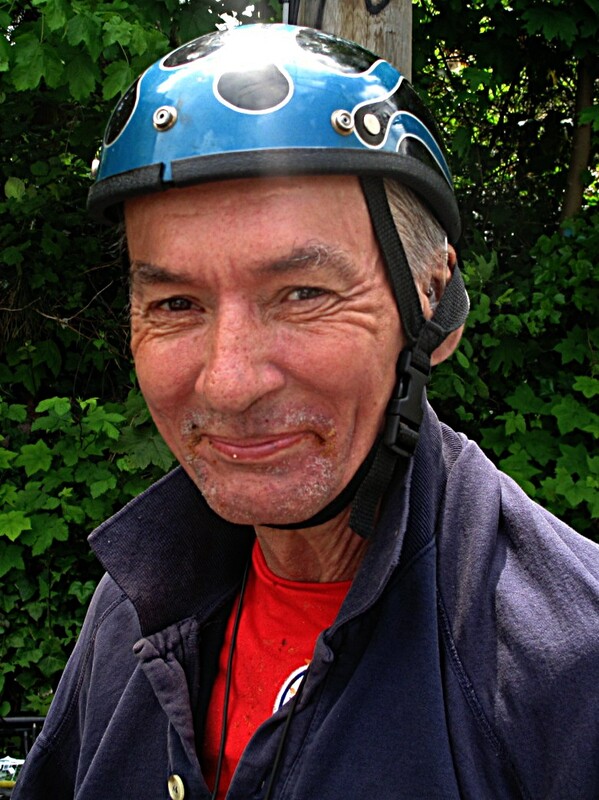 Some years back, Jimmy and I were at the Ridge Centre, at 16th and Arbutus, the day before Jimmy was to get his disability cheque. He needed $5. He promised to meet me at such-and-such a time, the next day, back at the Ridge. I lent him the money, with little expectation of getting it back so easily. The next day everything — cashing in my bottles, going to my locker — whatever. It all took too long. I wasn’t going to make our scheduled rendezvous, but I tried. 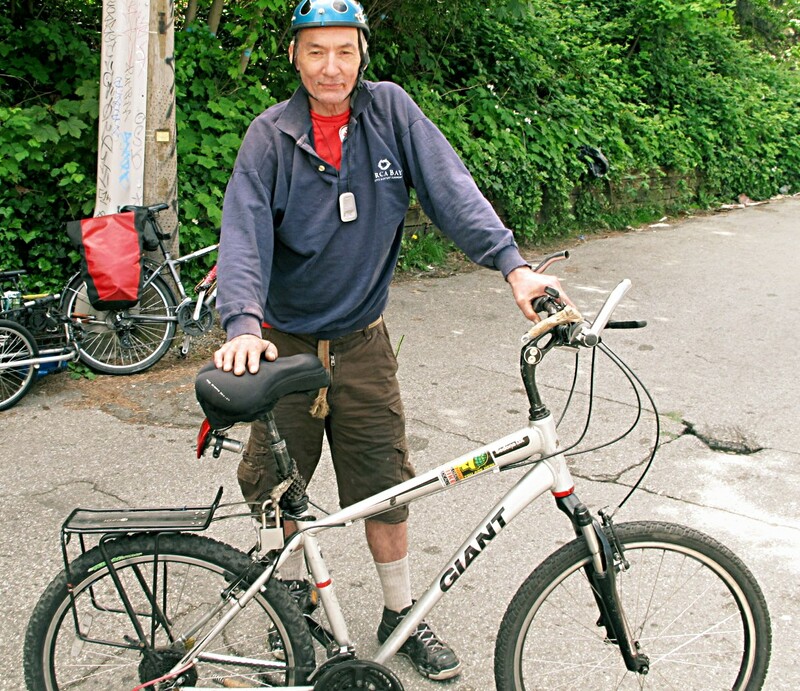 I was booting it West up Broadway a few blocks before the turn South onto Arbutus, when I saw Jimmy, on his bike coming towards me in the East-bound lane of Broadway. He was coming to find me to pay me back. That’s Jimmy. He keeps his word, and, apparently, his appointments. Click the images to enlarge. 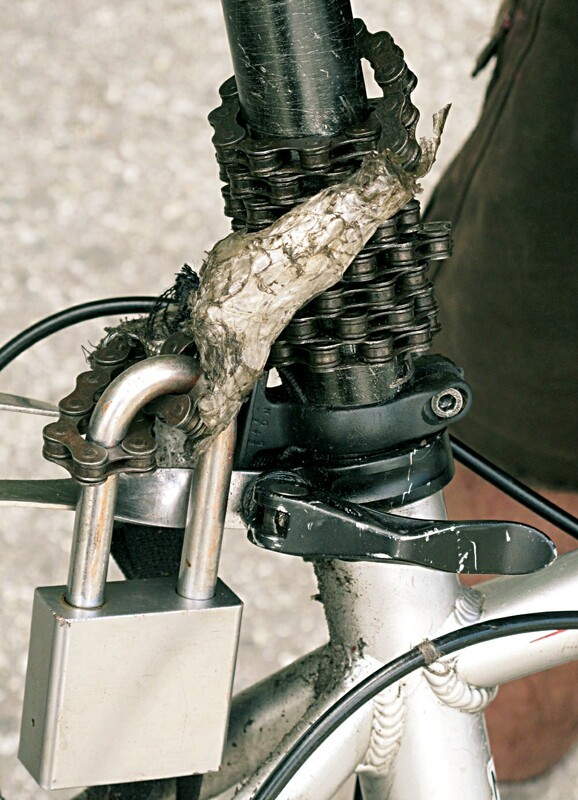 Here we see Jimmy’s using some bicycle chain and a good padlock, He says, he made the loop at the end of the chain, by tying the chain to itself using brake cable, and covering the handiwork with duct tape — helping to illustrate a rule about bike locks — locks are at least as strong as thieves think they are. In fact, Jimmy insists this is quite strong, the chain being hardened steel and tough to cut with a hacksaw. It’s a great example of a smart cheap-and-cheerful solution. Click the images to enlarge.